If you need to prepare an official document, for publishing or for a specific person, you would need a professional editing application, like MS Word, which is not cheap and it can be unforgiving to beginners. A more convenient solution is AbiWord. It is distributed as a freeware application and it offers everything you need to work with text documents, including support for MS Word formats and others. Getting used to the application's user interface and its controls is quite easy. The main editing window is kept clean and simple. All edition options, for cutting, copying or pasting, changing font and paragraph settings and other controls can be found on a toolbar, which is attached to the menu bar, on the upper edge of the screen. Besides these usual options, you can also find some of AbiWord's own features, like the possibility of highlighting pieces of text with different colors. Advanced functions can be found in the top menus. They allow you to merge your documents with email messages, define new styles, change the formatting of the text and paragraphs and much more. You can also create tables of contents, insert headers, footers and many other elements. As previously mentioned, AbiWord provides support for MS Word's DOC format, but it also supports many other formats, like RTF, HTML and more. This means that you can open Word documents with AbiWord, but you can also save your documents in these formats, so Word can open AbiWord's documents. The application is lightweight and easy to use. 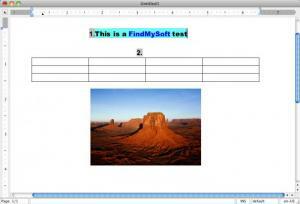 It provides most functions which you would expect to find in MS Word. Its controls are well organized and easy to find, which makes the application quite easy to use. The Mac OS X version is a bit outdated. AbiWord gives you the possibility of creating and editing Word documents on your Mac, without any kind of difficulties. You can download AbiWord free here.